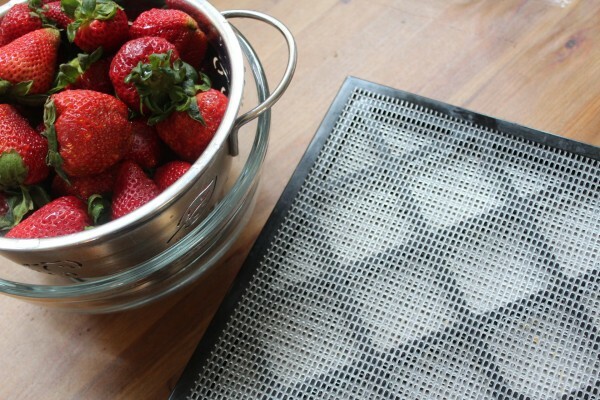 On my dehydrator recipes post, someone asked how to dry strawberries. Yes, you’re right, I showed them dried but I don’t tell you how. Much like fermented food, dehydrating fruit and vegetables is very simple, but if you haven’t seen food dehydrated before you might not realize how easy it is. 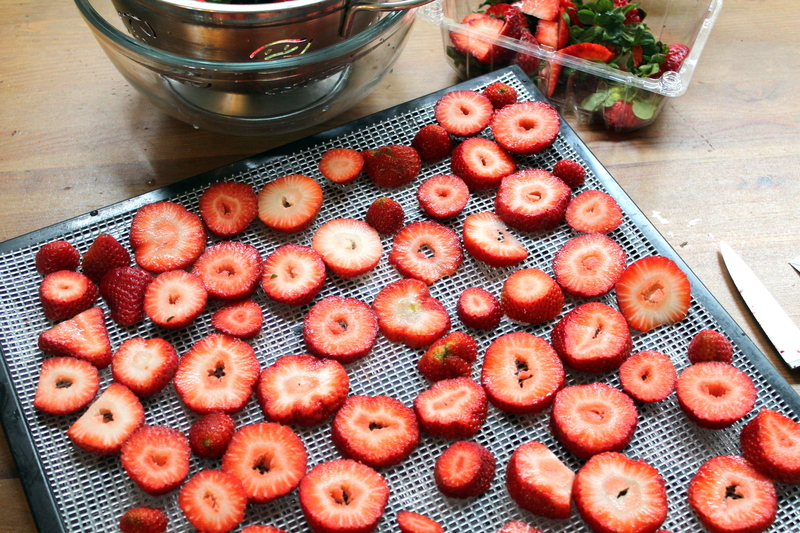 Below are the steps needed to dehydrate strawberries. 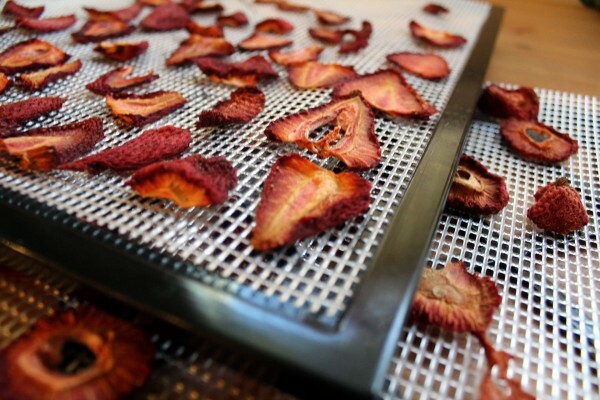 I love this whole process, from washing the bright red juicy fruit to cutting it and seeing the vibrant colors, to how when you put them in your dehydrator your entire house smells like strawberry pie, and then everyone loves packing and enjoying the finished product. I use an Excalibur Dehydrator, which I like because the trays remove and aren’t actually a part of the dehydrator itself, so I can use it for incubating yogurt in jars. You can find this dehydrator here. 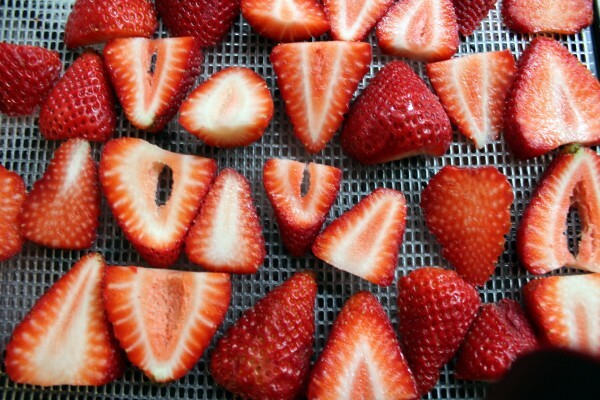 First, wash the strawberries and slice into even rounds or triangles – about 1/8-1/4 inch thick. Spread evenly on dehydrator tray, the pieces of fruit can be touching, but if you overlap it it will take longer to dry and stick together. Dry on high for 6 hours, or until shrunken and dry. 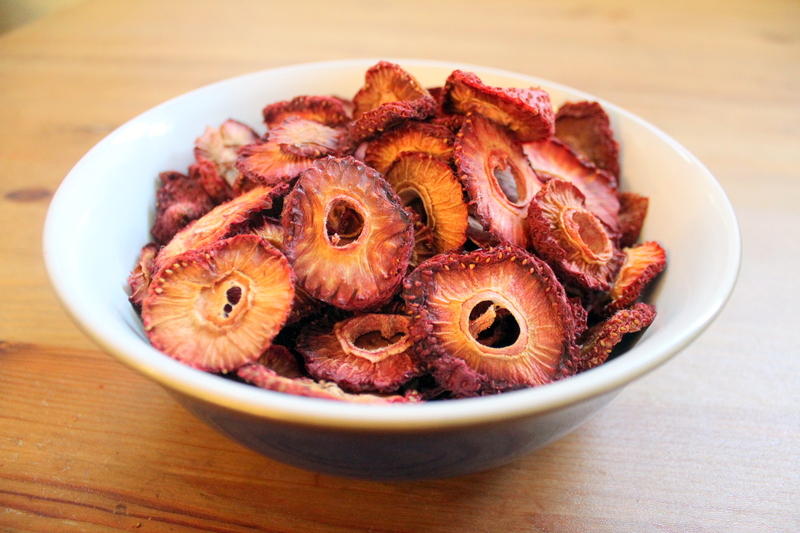 Dried fruit is very simple to make, strawberries are always favorites! 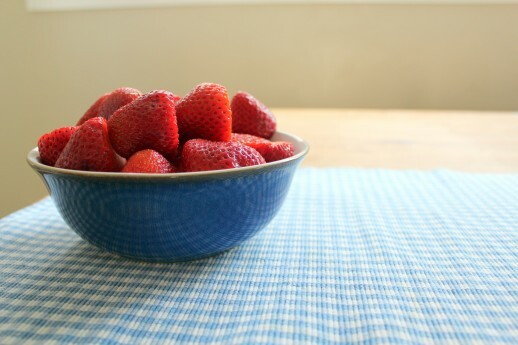 Cut into rounds or triangles, and enjoy the smell of strawberry fields through your whole house as the sweet red fruit dries. Cut off stems and cut into 1/8-1/4 inch rounds or triangles. Dry on high for 6-12 hours. Keep in an airtight container at room temperature for a few days, or in the freezer if storing long term. Store in an airtight container at room temperature if using within a few days, in the fridge or freezer if you are keeping it longer. This makes for great additions to trail mix, is perfect to pack in lunches or for hiking or road trips.